Peer to peer lending has always been around. Parents lend to children. Friends let friends borrow money. With online P2P lending, the practice has entered the mainstream, and has enjoyed higher levels of legitimacy due to stronger government oversight since 2008. For those hoping to acquire a loan through P2P lending sites like Prosper, the process is blessedly simple. 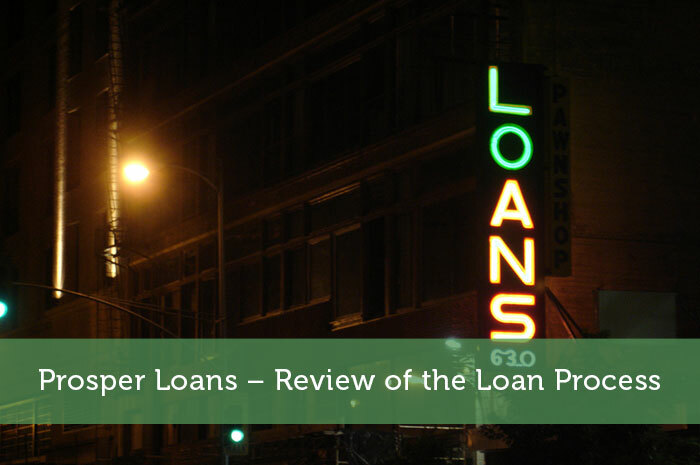 We’ll outline the steps you can take, with tips along the way, in our Prosper Loans Review. Check your Prosper rating. This ties in closely with your Experian credit rating. Only borrowers with scores of 640 or higher can apply, because these are the most likely to predictably repay their loans. Prosper ratings are as follows: AA, A, B, C, D, E, and HR. AA rated borrowers enjoy the lowest rates (advertised at 6.73% at the time of this writing), much lower than they could get through a bank or credit card company. The grades go down with your Experian credit score, all the way to HR (High Risk). These borrowers will get the highest rates offered to Prosper borrowers because they are the least likely to make a dependable return on their loan. Note: For those with high Prosper ratings, the rates that are possible are very low indeed. Prosper doesn’t have brick and mortar banks, nor does it have to provide gains to lots of stockholders. You, as a borrower, are dealing with just one investor who is facing a not-so-risky return on investment. Hence the lower rates. The only penalty you’ll pay is a $15 late charge. Not bad at all. You also don’t have to worry about an investor suddenly asking you to pay up all at once. Investors who need to liquidate suddenly can sell funded loans to other investors. It’s a seamless process for borrowers like you. Sign Up on Prosper. Signup is easy. You’ll list some financial information and personal details to get started. This will be easy for anyone who has used any kind of online banking. Prosper offers helpful customer service if you have any questions. List Your Loan on Prosper. This is where you get to lay out the details of how much money you need and what you need it for. Clear, direct writing is always a good practice here. The people reading your loan proposal are real people responding to your real need. Wait for a Response. Because this is a bidding system, a response may come quickly, or it may take a while. Have patience. The interest rates you can secure are worth it. The only extra fee you stand to pay is a 1% Prosper charge. Still not a bad deal at all. Settle on Terms With Your Lender. Have a conversation with prospective lender to agree on terms. This may take a little back and forth, but once you have agreed on the specifics, your money arrives in just a couple of business days. Talk with you securities advisor to make sure that the terms are right for you. Luckily, the terms are uncomplicated compared to traditional bank loans. Also the rates are lower, because there is no middle-man to pay off. Alaska, Colorado, Connecticut, Delaware, District of Columbia, Florida, Georgia, Hawaii, Louisiana, Minnesota, Mississippi, Missouri, Montana, Nevada, New York, Rhode Island, South Carolina, South Dakota, Utah, Vermont, West Virginia, Wisconsin, and Wyoming. California, Idaho, Maine, New Hampshire, Oregon, Virginia, Washington. Prosper is available nowhere else at this time. If you are in one of these states, and you have an Experian score of over 640, a Prosper loan might be a great way to secure funds at much lower than average interest rates. Talk it over with you financial advisor and decide if a Prosper loan is right for you. We expect this to be a promising option for many, and hope this guide makes the process even simpler. Situating in Nevada, I have availed a prosper loan twice. The lowest rate I had was 6.25%, which I think is very reasonable. My advice is ask a consultant if it fits your situation and needs just to make sure everything will turn out perfectly good. Thank you for the great information. I am working hard to get out of debt right now, so I’m not going to add another debt/loan to my portfolio, but this sounds so easy. Maybe one day I will try it. Well prosper loans seems to be a ray of light for many to utilize it in a better manner. As the same is not only easily available, but is offering a lower rate of interest.